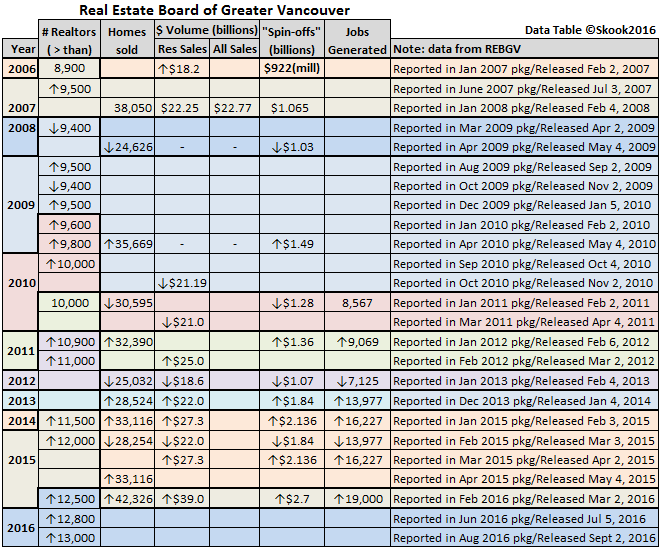 How carefully do you read the News Release that accompanies the REBGV monthly stats...always...usually...never? I have to confess I never read it top to bottom. The letter is so formulaic that I skim and scan and zero in on the same info each month. I think there might be an unintended benefit to the Board if most readers do the same. This weekend I was going through those letters very carefully and began to notice that blurb at the bottom in fine print just above Mr. Munn’s contact info. It's the one that always begins, “The real estate industry is a key economic driver in British Columbia.” Hmm, such significant data in such tiny print, but the media doesn’t miss it because those are great numbers to report requiring absolutely no work – ideal for understaffed newsrooms; and, that is why the Board includes it month after month, year in and year out. You’ll notice I'm covering the years 2006 to 2016 and have colour coded each year; also, that there’s a stagger in the colour between the Realtor® numbers and rest of the economic data. The reason for the stagger is that Realtor® numbers are reported in the year they occur whereas the economic data is reported the following year. Generally, the economic data for the preceding year is released in February; however, there have been exceptions such as in 2009 (US financial crisis) when data was released as late as October 2010. For 2013, the data was released in January 2014 – the only time for such an early release; likely due to how Christmas holiday dates fell. 2014 shows some bizarre reporting probably due to inadvertent carelessness. I’m thinking whoever prepared the Feb 2015 report likely pulled up an older 2013 template, copied and pasted the new monthly letter but forgot the “spin-off blurb” info may have changed. As you can see, it took a few months to straighten the goof. As for the number of Realtors®, the Board’s wording is “...representing more than [x number of] REALTORS® and their companies”, hence my use of “> than” at the top of the column. As you can see, 1,000 Realtors joined the Board in the last 16 months (Mar 2015-Aug 2016) with 200 of those joining between July 1st and Aug 30th 2016 alone. Yep, without a doubt, it’s definitely been a growth industry. I wonder how many of these new Realtors® may have come from Alberta or are BC university graduates tired of working the cashier line at the local IGA? I’ll do my best to keep this table updated. You’re welcome to grab the image for your own reference. If you use it on a blog or website, please give credit by posting this blog’s link.